Back at the Belcroft, one of my favourite barn wedding venues! A beautiful, toasty warm day greeted us as we arrived for Sam and Taylor’s big day. Getting to know these two has been so much fun and their wedding party was every bit as fun. We met for the first time during their engagement shoot and hit it off right away. They’re two genuinely fun, kind people who are over the moon for one another. Pro Tip: When planning where to get ready the morning of your wedding, plan to get ready right at the Belcroft. The guys are easy, The Man Cave has a large screen TV, pinball machine, pool table and vintage automobile parked in it. It’s a no-brainer, the guys will totally dig it. As for the girls, there are a few options. Option one is a bridal room right off of the reception area up front. It’s the smallest option with limited lighting so from my perspective I’d place it 3rd on the list. Another option is the Belcroft Spa which is more spacious and has many more vintage character features/furniture. It’s also located at the rear of the property so you have privacy from your guests before the ceremony. The third option is the one I find used most often, with is the bridal suite above the Belcroft Spa. It is spacious and has kitchen facilities along with oodles of light beaming in from the large front window. And being above the Spa, it’s also in a private area off limits to guests. Keep in mind, this is coming from a photographer’s perspective. My first choice is the bridal suite above the Spa, the Spa itself would be second and then the front entrance room 3rd. The first thing I look for in any prep room is light… LOTS of light. The second is space, how much room do we have to work with because with your bridal party all there with their own items scattered around – we want space to move around for the best opportunities for photos. Samantha: My horrible handshake… I was in my third year of University and had been talking to Taylor online everyday for about a month before we decided to finally meet each other. I had been working on a group project due after the weekend and our group meeting had run late so I was looking spectacular in a sweatshirt and yoga pants. We decided to meet at the Second Cup close to my apartment, so I headed over there shortly before we had arranged to meet. I arrived at Second Cup and grabbed a table, and then waited, and waited. Taylor messaged me to let me know that he had gotten stuck in traffic and that he would be late, so I told him not to worry and I would just hang out until he arrived. About 15-20 minutes later, I get a message saying he’s here, so I go to meet him at the front entrance and as he introduces himself and goes in for a hug, I stick out my hand and introduce myself with a handshake. When I look back now, I was really just warning Taylor about the awkwardness that would ensue by dating me – you do not want to hear about our first kiss. Anyway, I don’t know how I recovered from that GREAT intro, but Taylor stuck it out, and he did get his hug at the end of the date. Taylor: How relaxed we both seemed after the initial awkward introduction. We sat and talked for hours. Samantha: Taylor’s probably going to have this super romantic story and make me look bad. I don’t know that there was a “specific” moment when I knew that I would marry him. I mean when we started talking about buying a house together, I knew we were pretty serious – but we talked about some pretty serious stuff early on in our relationship: how many kids we wanted, what we would do in difficult situations – and we’ve always been lined up. It was probably (see I sound horrible…) when we were renting our apartment together, you start sharing finances and sharing your own space with someone and you start getting into these little arguments and being driven up the wall by the little things you never knew, or noticed, about the other person, but you also find out what your relationship is made of. He never gave up on me – and let me tell you, I am NOT the easiest person to live with, and in my early 20s (heck, even now…) I was definitely no where close to the easiest person to share finances with – and yet, we stuck it out and managed to still love each other even when we didn’t like each other. It wasn’t this big fairy tale moment, it was just real life. He was the person I wanted to go through life with. Taylor: When Sam was finishing up university we started looking for a place to live together without really talking about it first, we just both wanted the same things and wanted them together. Samantha: Ha! Okay, you need to hear this from both our point of views, because oh my was I being a WITCH that night. So it was December 30, 2017 and we were heading to Toronto the next morning to fly out to Florida for a family vacation. In typical me fashion, I had left everything to the last minute and was trying to update my phone with music for the plane ride (priorities!) Taylor is just sitting around because he is not only organized but he can also pack a bag in a minute flat, well doesn’t he go downstairs and come back up with the canvases and paint AND STARTS PUSHING ALL OF MY STUFF TO THE SIDE. The death glares this man was getting, and in typical Taylor fashion he just keeps pushing my stuff over and then tells me to take a break and to spend some time with my boyfriend (Taylor is the bravest man I know). So I give him my most dramatic sigh and make room on the kitchen table for the canvases and paint. I set myself up and start looking up designs for my canvas, and Taylor, brave soul he is, makes the comment that he doesn’t need to look at any designs because he’s creative enough to make his own – the death glares continue. So we start painting and I start to relax and my mood brightens quite a bit, I’m only about half way done my small canvas, when Taylor starts on his second canvas. Well he finishes his first two canvases, and puts them up almost like a barricade “to dry”, well I’m busy starting my second canvas so I’m oblivious. Taylor: We had cheap canvases and paint in the basement that I had bought long before the night I proposed. I had the ring and just decided to pull everything out and start painting, the last one I painted said “Marry Me?”. Early date to popping the question. – photos courtesy of the happy couple. Belcroft Estates legend, “Daisy” is a popular feature. Samantha: His heart. He puts on a tough front, and no one would know it just by meeting him, but he’s got a HUGE heart. He’d go to the end of the earth for those that he loves, and he doesn’t take kindly to anyone who disrespects me or threatens my happiness. He’s always been a sweetie to me, he opened my car door for me for probably the whole first year (and more) that we were dating. He’s my best friend. Taylor: She loves me for all my strengths and weaknesses. And she still lets me go fishing with the boys. Yes, that’s fresh funnel cake – the Belcroft team knocked dessert outta the park! Samantha: The moment Taylor turned around and saw me for the first time at the end of the aisle. I don’t really know what I was expecting, a special smile, a loving laugh – but I got more than I could’ve ever hoped for or imagined. The look of pure love and happiness on his face, I have nothing that could beat that moment. I’ve always thought I knew how much he loved me, but I really had no idea – that moment is everything and more about why we were there, why we were getting married – I have never loved anyone more and I have never felt more loved. Second to that… unfortunately I got really light headed during Taylor’s speech and it continued for the rest of the night and while it meant there were some delays and changes, it also gave Taylor and I a ton of private moments, just the two of us. He wouldn’t leave my side. We would be on the dance floor, and he would see my eyes start going, so he’d take me off the dance floor and we’d go sit down. We got to just enjoy being with each other, as husband and wife. One of “our” songs came on – Hey Pretty Girl by Kip Moore, and we were downstairs during one of my light headed episodes – I told him we couldn’t miss this song, so he grabs my hand and tells me we can dance anywhere. So we head out to the lower bar and dance, just the two of us. It was such a perfect moment. Taylor: Seeing her for the first time walking down the aisle. Breathtaking. Belcroft Estates wedding ceremony in the pavilion. Don’t be afraid to stick to your guns. I got caught up seeing everyone during cocktail hour and wished I had moved everyone along a bit faster so we had more time for pictures. Belcroft is a HUGE venue and while we still got all the pictures I wanted, I wished we had more time for bridal party pictures in different locations. But otherwise, our day was pretty perfect. We made sure our day was personalized to us. I wrote our ceremony – with help from our officiant, we wrote our own vows, and we made our own decor – it was a lot of work, but it resulted in a day that perfectly embodied us and our relationship and I think that is really important. After all the planning and scheduling, just enjoy the moment, and be sure to sneak her away from the crowd to just sit quietly together. WHAT MADE THEM CHOOSE BELCROFT ESTATES? I don’t know how anyone visits Belcroft Estates without booking it. 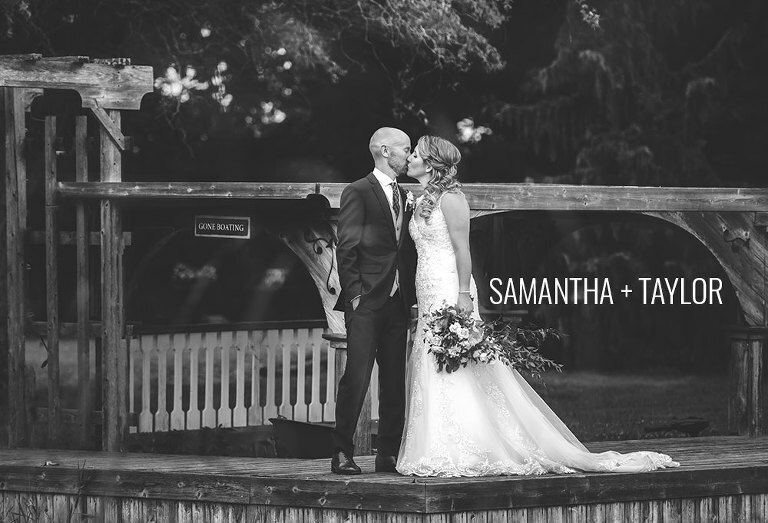 Not only are the grounds perfect and perfect for pictures, but the venue itself is so easy. We really didn’t have to do a ton decor wise because it is so beautiful on it’s own. 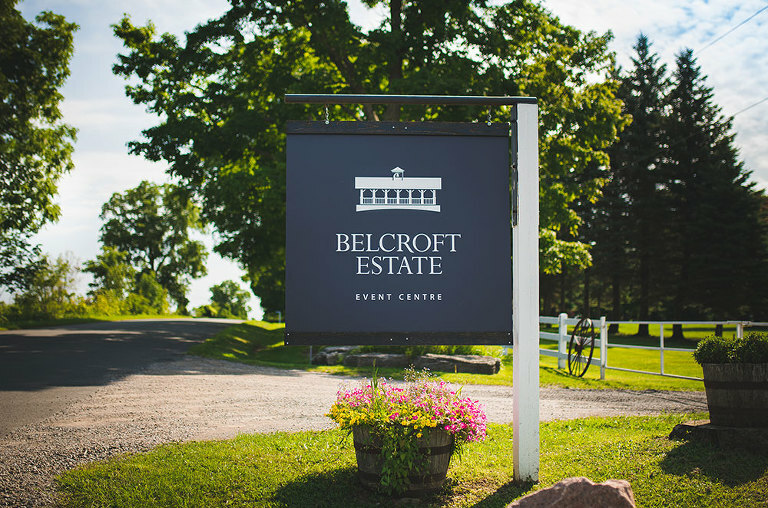 The staff at Belcroft, and their DJ and Caterer, were also phenomenal – everyone was so helpful (especially when I needed to just sit down) and made sure that our day was everything we wanted it to be and more. We couldn’t have chosen a more perfect venue. Seeing Vaughn’s photos from past wedding he’s done at Belcroft Estates were absolutely amazing, everything about the venue is amazing. Hard to beat a place that has everything. And this amazing love wedding sign was made by the man himself. Yep, Taylor made this beauty!